I know many people think salt is bad for you because that is what the American Heart Association seems to preach. But salt is not bad for you and it is very necessary in our diet. What I think the American Heart Association bases their recommendations off of is the idea that the average American eats A LOT of fast food, and a lot of over processed foods. Fast Food contains a lot of sodium as do over processed foods. Often times food stuff can be “lite” or “less fat” and still flavorful by adding more sodium. So, I believe that the American Heart Association thinks there is too much salt in the average American diet and with that their recommendations have scared people away from salt. I started off with that because I am going to post about salt. Not just any salt but a particular salt. I have a friend that visits Hawaii once a year, I believe. She is one of the generous people who buys gifts for people whenever she goes on a trip. Well, one year she brought be a few salts and spices. Since she bought me a few it took me awhile to get to using them all. Well, there was one that once I opened it I used it on everything I could use it on. I fell in love with Hawaiian Guava Smoked Ginger Lime Salt. I used the Hawaiian Guava Smoked Ginger Lime Salt so much I quickly went through it. My friend always asks me what flavor to bring back when she goes and I tell her Hawaiian Guava Smoked Ginger Lime Salt. But the last time she went to brought me Aloha Spice Company’s Aloha Vanilla Hawaiian Cane Sugar so we could see what that was like. She didn’t bring me the Hawaiian Guava Smoked Ginger Lime Salt. So I got to thinking . . . maybe I could just buy it from Aloha Spice Company. Well, of course I can. But I can also buy some flavors through Amazon. So that is what I did. I don’t use the Hawaiian Guava Smoked Ginger Lime Salt on everything that can be salted because I am not sure the Hawaiian Guava Smoked Ginger Lime flavor would go with everything, but it pretty much goes with ALMOST everything. It is great on veggies. You know, if you have ever read one of my posts about veggies, you know I love to roast veggies. The Hawaiian Guava Smoked Ginger Lime Salt on roasted veggies . . . . . WOW! So good. She had also brought me Kiawe Smoked Garlic Hawaiian Sea Salt. Since I use garlic on pretty much everything I cook . 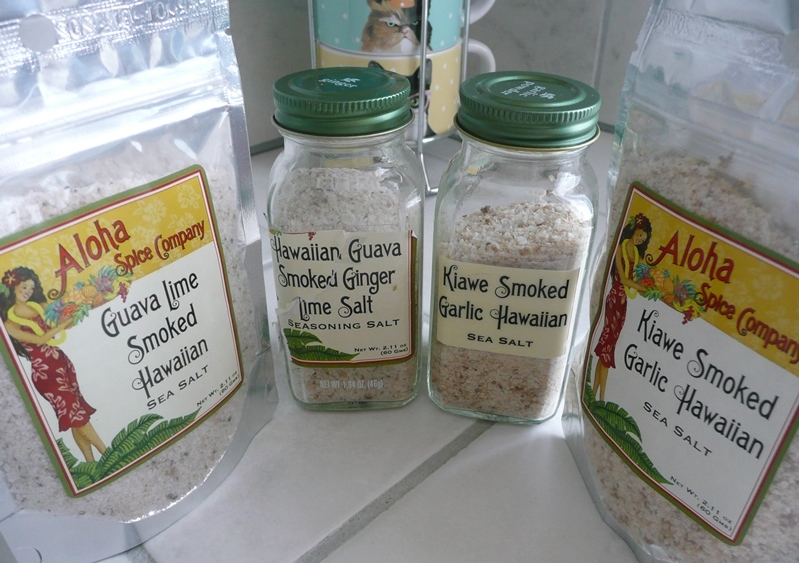 . . so using the Kiawe Smoked Garlic Hawaiian Sea Salt is really not a big change. I also got some Guava Lime Smoked Hawaiian Sea Salt, which is not as flavorful as the one with ginger, but it is very good. It is amazing, to me, the different flavor that these salts add to things. 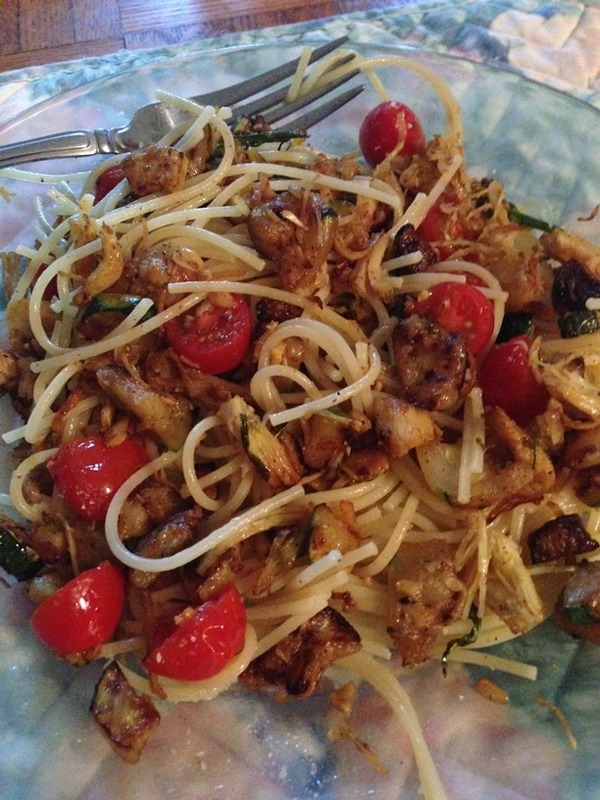 Not an over powering flavor, but just enough to make things I would use garlic salt on anyway – very, very yummy! The salt comes in little bags which I find tedious to use. So after my friend brought me a few bags of different types of spices I started saving the spice bottles from the organic spices I buy. They are glass and really nice to use. The label peels off them very nicely and they wash up really well. Once the spice that is in the bottle is done, I peel off the label and put the bottle in the dishwasher. Then I peel (I think I peeled once and that is why the Hawaiian Guava Smoked Ginger Lime Salt label is ripped) or cut out the Aloha Spice Company label and stick it/tape it to the jar. So much easier to use the spice from a shaker jar. So if you are looking for a little taste of the island 🙂 and you cook things that you like to salt, you might want to check out Aloha Spice Company and see if there are any spices that you might like. They sell a lot more than just salt blends.